Part 4 in a series of posts looking at typography trends that we predict will influence graphic design in 2018, and explaining how you can incorporate each trend into your work. HOW TO USE THIS TREND: Add a flared or a serif typeface to create warmth and convey depth of knowledge. Flared letterforms and serifs are making a reappearance on the main typographic stage and this is a trend set to continue as the serifs get more pronounced. These have warmth and personality, “I think this is a reaction against the cold, sterile neo-grotesques like Helvetica that seem to be dominating the design landscape.” says Typewolf’s Jeremiah Shoaf. In addition, traditional sign writing has had a resurgence in recent years. As a result the flared styles often created when using a paint brush are increasingly reappearing on the high-street and also being taught to graphic designers in sign writing workshops. Below is the work of London’s Pete Hardwicke featured in Spitalfields Life. Throughout history styles from different mediums have influenced each other, as is also happening with chromatic type (to be featured in trend 6). In Type Tasting research it has been shown that content read in a serif style can come across as more knowledgeable and better researched. Studies also show that a less ‘easy-to-read’ typeface could make content more memorable as it is less likely to be skim-read. Some of these are revivals from type history, such as Toshi Omagari’s Albertus Nova, a revival of Berthold Wolpe’s original from 1932. Wolpe modelled the flaring serifs of the original design on his time spent designing letters in bronze. Using the original sketches, Omagari was able to restore some of the designer’s original intentions—such as the flared elements that Wolpe had to compromise on as a result of the limitations of technology of the time (read more). Many of these typefaces are from the 1980s, reflecting the popularity of Stranger Things and all things 80s. These include Amerigo designed by Gerard Unger in 1987, Baker Signet designed by Arthur Baker in 1989, Icone designed by Adrian Frutiger in 1980, or Miguel Reyes’ recently released Canela. Above is Canela by Miguel Reyes . Americana, below, was designed by Richard Isbell in 1965 with flares that have formed into serifs. The Guardian’s new typeface, Guardian Headline created by Commercial Type, champions the serif styles that are becoming more popular. 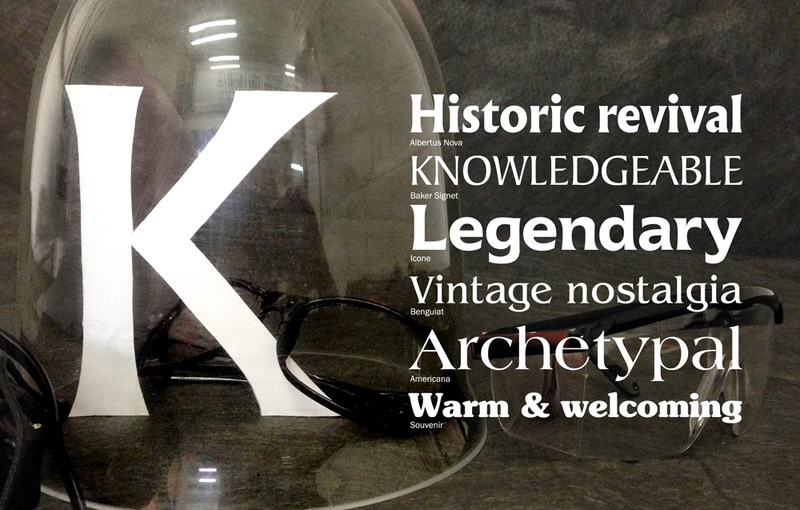 Readability is at its heart with large x-height and short ascenders/descenders. Typefaces with a similar feel include Imperial, a newspaper text face by Edwin W. Shaar, Malabar by Dan Reynolds, and Caslon Grafique designed by Leslie Usherwood developed from the original Caslon designs of the 1700s. Post 5 will look at colour fonts. Would you like to learn more about typography? Get in touch with Sarah here to book a Type Tasting workshop or event that teaches you about type trends through history and the psychology of typography with lashings of interaction, games and activities. Sarah Hyndman is the founder of Type Tasting, she is a regular public speaker, researcher and the author of both Why Fonts Matter and How to Draw Type and Influence People.